Justin Chapple may have trained at the French Culinary Institute, but he knows how people really cook at home. He grew up with a large family, first learning kitchen tricks from his grandmother who made do with whatever they had, and she made the food delicious. Now Justin is the host of Food & Wine’s award-nominated Mad Genius Tips video cooking series, and appears regularly on TODAY and other television shows as their resident kitchen hack expert. In his job as the Deputy Editor of the test kitchen, he’s often asked to take recipes from superstar chefs (think David Chang and Thomas Keller) and simplify them for home cooks. 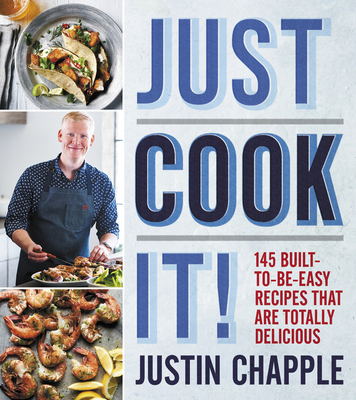 Now he is putting all of his expertise to good use in Just Cook It!, a collection of 145 mouthwatering recipes like Avocado Pizza with Dukka and Stovetop Mac-n-Cheese with Bacon Breadcrumbs, with Justin’s signature time-saving tips and hacks throughout. As the Deputy Test Kitchen Editor at FOOD & WINE, Chapple tests and develops hundreds of recipes a year for the magazine, digital projects and cookbooks. Justin also teaches wonderfully oddball kitchen hacks as the host of F&W’s video series Mad Genius Tips, for which he was nominated for a prestigious James Beard Award. In addition, Justin is the author of F&W’s cookbook, Mad Genius Tips: Over 90 Expert Hacks and 100 Delicious Recipes. Justin joined FOOD & WINE in 2010 as an Assistant Event Coordinator, helping produce the FOOD & WINE Classic in Aspen. Before joining FOOD & WINE, he graduated from the French Culinary Institute and worked under chef Alain Allegretti in New York City. Justin appears regularly on NBC’s Today Show.